A set of historic Colt revolvers owned by a prominent Union general could fetch more than a quarter million dollars at auction later this month. Rock Island Auction Company will present the foursome of percussion Colt revolvers engraved by the famed gunmaker himself, less than three months before his death in January 1862. “This set is easily one of the most important and historic sets of Colt revolvers in existence and was presented in the fall of 1861 during the uncertain early days of the Civil War when the preservation of the Union was in dire risk and the devastation the war would bring was still unknown,” the company said in a preview of the listing. Samuel Colt presented the set to Brigadier General Andrew Porter on Nov. 1, 1861 while entertaining a group of Union military officials — including Secretary of War Simon Cameron and Gen. George B. McClellan — at his Connecticut home. 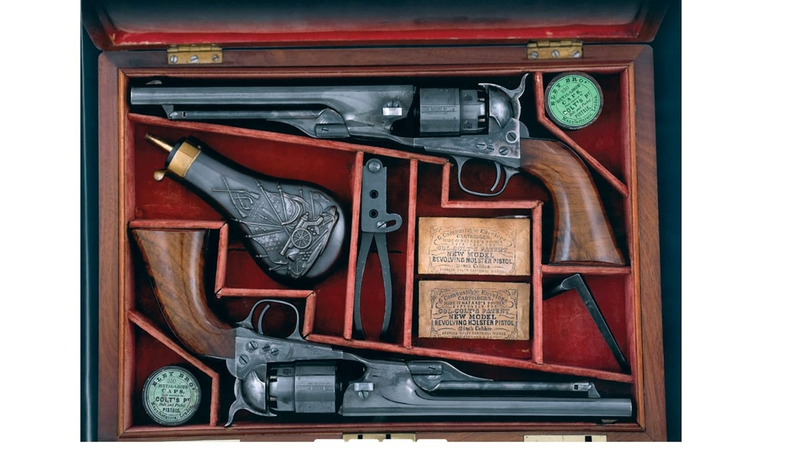 The set includes two Colt Model 1860 Army revolvers, a Colt Model 1861 Navy revolver and a Colt Model 1862 Police revolver. Historians theorize Colt presented the gifts to dispel rumors circulating about him aiding the Confederacy in months prior and to “grease the wheels” for future government contracts. Rock Island values the set between $250,000 and $375,000. It, along with other rare and historic vintage firearms, will be offered later this month during the December Premier Gun Auction, scheduled for Nov. 30 through Dec. 2 in Rock Island, Illinois.